It’s another rate hike for forex junkies! 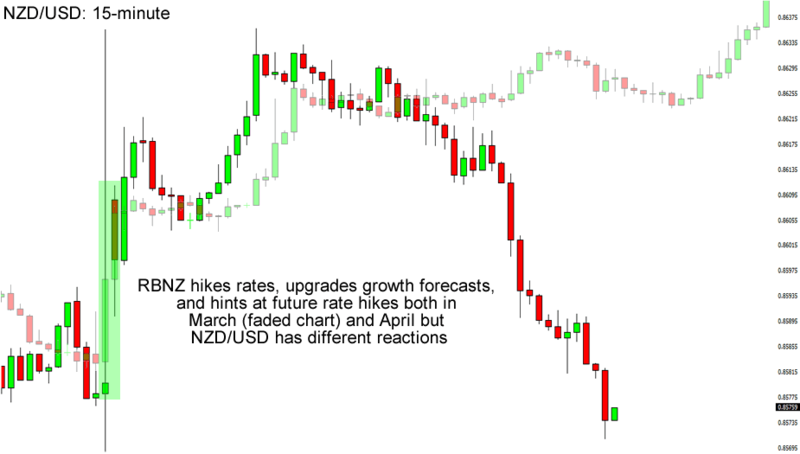 What factors led to the RBNZ’s decision and how did it affect NZD? Here are 4 things you need to know! As widely expected, the Reserve Bank of New Zealand (RBNZ) raised its interest rates for a second month in a row. Its rates are now up by another 25 basis points (bps) to 3.00%, a high not seen in three years. Consumer prices played a big factor in the decision. RBNZ Governor Graeme Wheeler said that interest rates should be brought to levels where they’re no longer adding to inflation. Unlike last month though, Wheeler was a bit more cautious, saying that future rate hikes will depend on economic data and inflationary pressures. Last month the central banker hinted that rates will be raised by as much as 200 bps through late 2015. With New Zealand’s latest quarterly inflation report widely missing expectations and prices of dairy, one of the country’s top export products, falling significantly since the last RBNZ meeting, market players had expected a less hawkish statement from the RBNZ. Instead, the central bankers only recognized the decline in dairy prices but went through with their decision. Heck, the RBNZ has even upgraded its growth forecasts and is now expecting a 3.5% GDP growth in the year ending March 31, 2015, up from its 3.3% estimates last month. Talk about optimism! Central bankers usually use their monetary policy decisions to jawbone their currencies a bit and the RBNZ didn’t miss the opportunity this month. The RBNZ said that while the Kiwi’s strength is helping keep inflation in check, its current levels is not sustainable and is a challenge for New Zealand’s exporters. Compared to last month, the Kiwi didn’t get as much love from the currency bulls. This is probably because investors didn’t expect growth forecast upgrades and hints of future rate hikes last month. This time around the good vibes only lasted a few hours into the Asian session before overall risk aversion (and maybe profit-taking) took its toll on the Kiwi. NZD/USD didn’t even reach the .8650 handle before it fell back down to its pre-decision levels. That’s it for today’s forex update, folks! In your opinion, what does NZD’s lack of positive mean for the currency? Does this signal a top or are the bulls just taking a breather? Let us know through the poll below!